The Welsh word fferm describes a working farm, typically tenanted. The word ffarm refers to an estate or manor farm that typically owned the land to many ffermydd (farms). 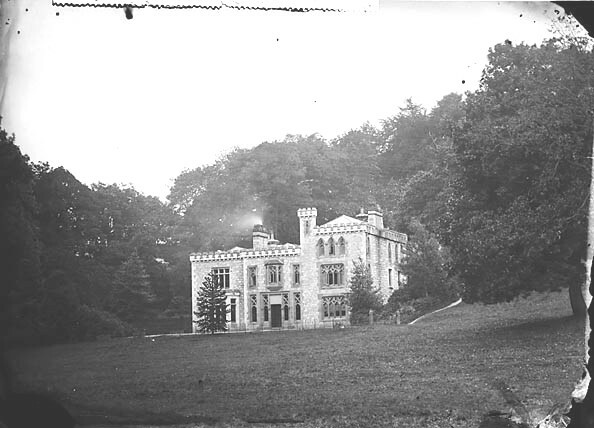 The Ffarm has long been a feature of Betws-yn-Rhos and the earliest records relating to the Ffarm appear in 1686 when it was owned by the Wynne family. 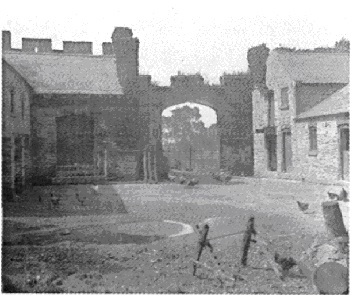 The Wynnes also owned Coed Coch and the Ffarm has always played second fiddle to its larger and grander neighbour. The Ffarm was originally much smaller and is believed to date from 1706 when it was owned by the Oldfield family and Oldfields have been resident at the Ffarm right up to 1963. The Ffarm as it appears today dates from the 1840s when John Oldfield elected to follow the fashion for having one’s own little castle. The original buildings were substantially remodelled and extended with the addition of the castellated façade and false turret. 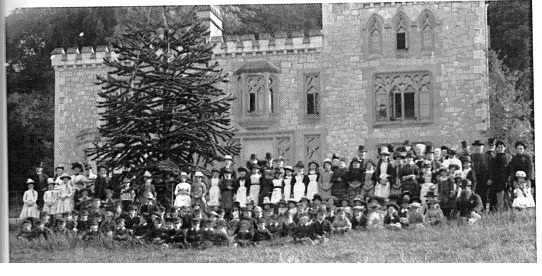 The new Ffarm was initially occupied by Thomas Oldfield who one of John’s 14 children. Thomas and his wife Janet had two children, a daughter Elizabeth Ann and a son John Edward who trained as an attorney and eventually chaired the local Petty Sessions (similar to a magistrates court) which were held in a large vaulted courtroom at the rear of the Ffarm. The Ffarm, whilst leasing much of its land to tenant farmers, still worked a considerable acreage and behind the main house there were various outbuildings comprising a granary, stabling for 10 cattle, a pigsty, poultry house and barn. These outbuildings and the rather grand arched entrance remain and now comprise residential accommodation (the Granary Cottages and Coach House). John Edward’s son Anthony Oldfield, born in 1879, was the last of the male Oldfields. He survived service in the Great War but later died tragically in a cycling accident. 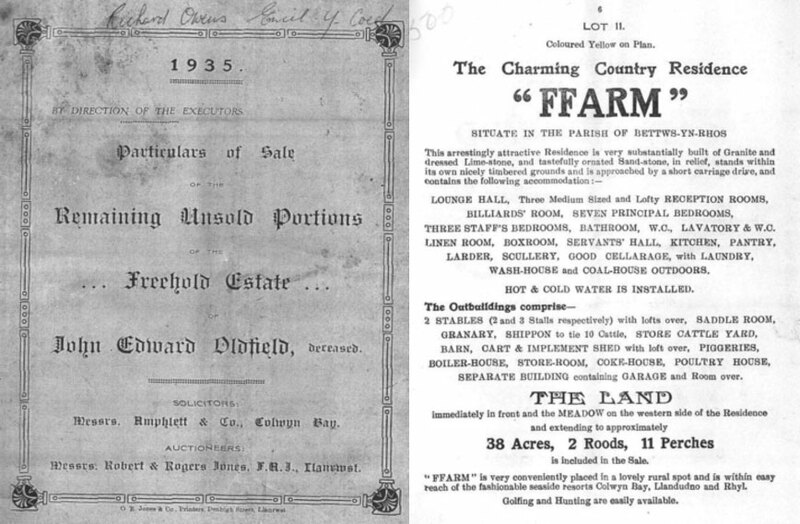 John Edward died in 1935 and his death initiated a significant auction of the Oldfield estate with even the Ffarm up for sale. However the Oldfield name continued at the Ffarm with Anthony’s two sisters (who never married) continuing in residence until the late 1950s. 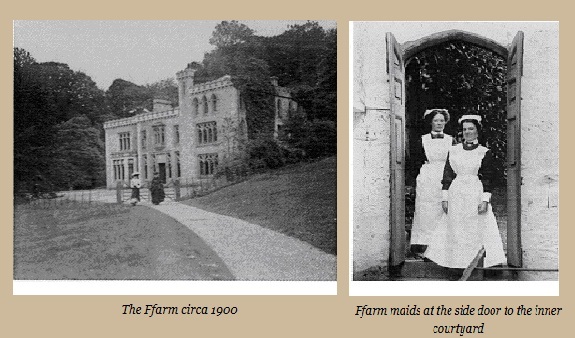 The Ffarm was finally sold to Mr Sidney Lomax in 1963 and converted for use as a Hotel and Restaurant. The restaurant became extremely popular in the local community and tea dances were held in the old courtroom. Sidney’s son Richard continued with the restaurant business up to 2006 when the Ffarm was sold to Jeremy Platt, a local wine merchant. Jeremy carried out most of the refurbishments one can see today and the restaurant, which used to occupy much of the ground floor, was scaled back and eventually closed in 2010. More information regarding the Ffarm and the village of Betws can be found in the book “Betws-Yn-Rhos” by J Alan Wheway copies of which are to be found in the rooms.